I was asked this week to contribute to an article for the Huffington Post UK. The last time they asked for my thoughts it was for my fashion advice about what I thought all 40-year-olds needed to know about fashion. Now they wanted to know what I’d tell my 20-year-old self about taking care of finances. That answer was easy: Save 30% of your earnings. 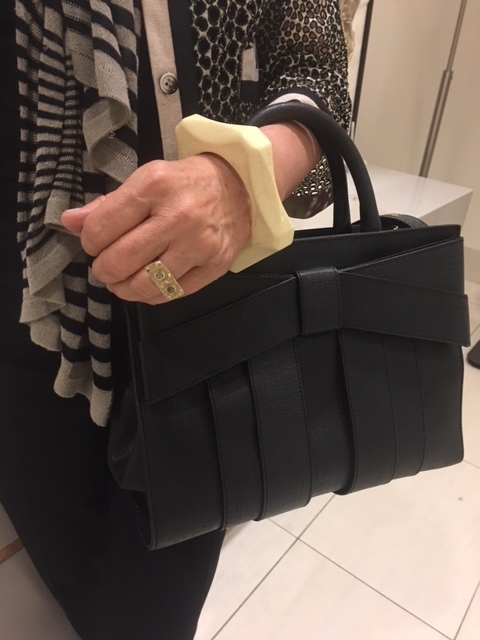 But of course, all thoughts lead back to fashion like the snap of a rubber band so ten seconds after sending that reporter my answer, I got to thinking about what fashion advice I’d have given my 60-year-old self. I have the great pleasure of working with women every week who are in their 50s, 60s, 70s, or so. So my advice to them is one-on-one and very specific. It was fun to think about this stage of life as a whole and to think about what I’d tell every woman over 60 if I had the chance. I don’t think I had a clue about what fashion and style would be like when I hit my 60s. Especially when I was wearing ripped up jeans and clogs in my 20s and short skirted suits, tights and heels in my 30s. In my 40s I wrote a book for women in their 40s. I gave them all the advice I could to help them them figure out how to dress when their teenagers were piercing everything and dying their hair purple and their memories of their mothers were of being in house dresses that were sold on the basement floor of department stores. But things change and whoever is saying that 60 is the new 40 is working for an ad agency. 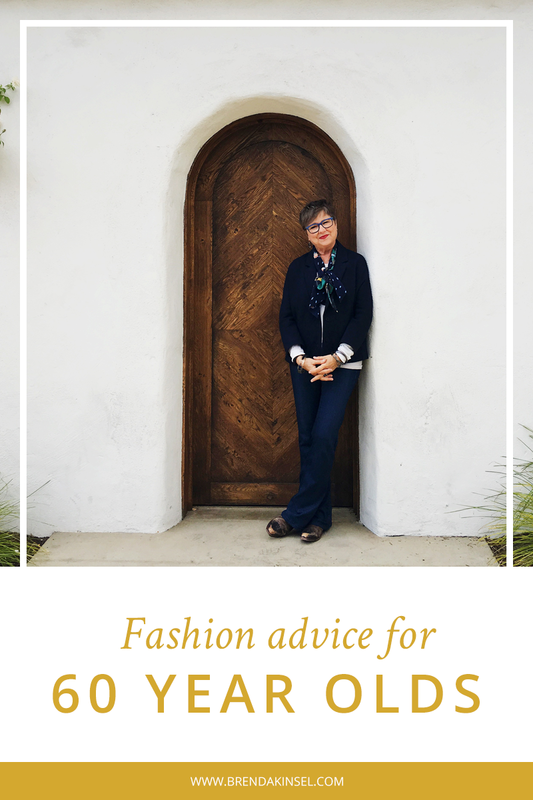 Why does a 60-year-old need fashion advice? Wowie zowie, a lot has changed since our 20s! Jobs, partners, locations, income and waistlines. Lots of changes. I sat down and thought about what I’d tell anyone’s 60-year-old self and this is what I came up with. 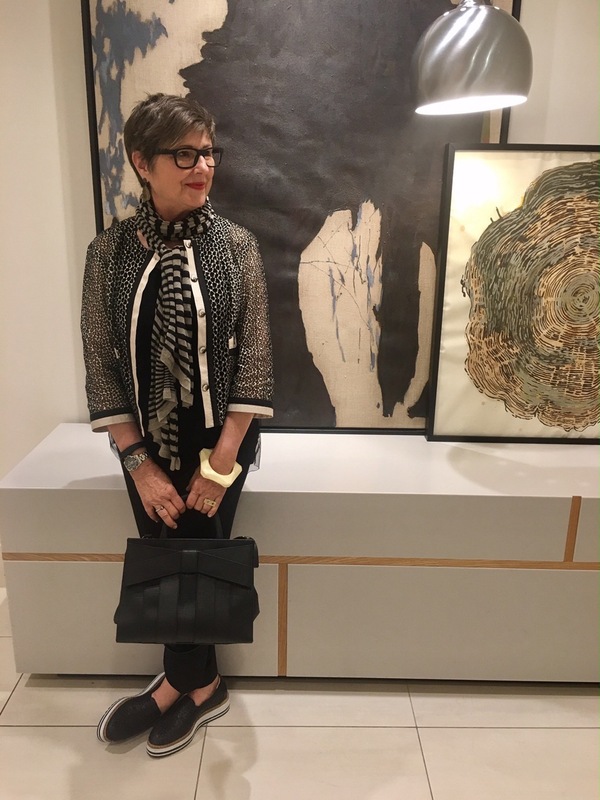 Fashion advice for the woman over 60: Do not be afraid! Don’t be afraid to be noticed. Don’t be afraid to stand out in a crowd. Don’t be afraid to dress like you’re heading to a party even when you’re not. Don’t be afraid to be inspired by what a 20-year-old is wearing. Steal her color combo idea, the way she stacks her bracelets, her choice of socks with shoes. Your version will be right, right now. There are more areas to decorate than your waistline, like your wrist! Fashion advice: Don’t be mad about the things you cannot change! Don’t get mad at your body for moving its weight around. If your weight settles into a new location, do a fashion workaround. Don’t deny yourself the pleasure of looking good for no reason, no reason at all. Some people live their life overdressed for every occasion and it’s just their style DNA. You can’t argue with genetics. You can’t change how everyone else is dressing. You can make your own style statement and it’s okay. We’re 60. We don’t have to do what other people do. Add some camouflage when needed. 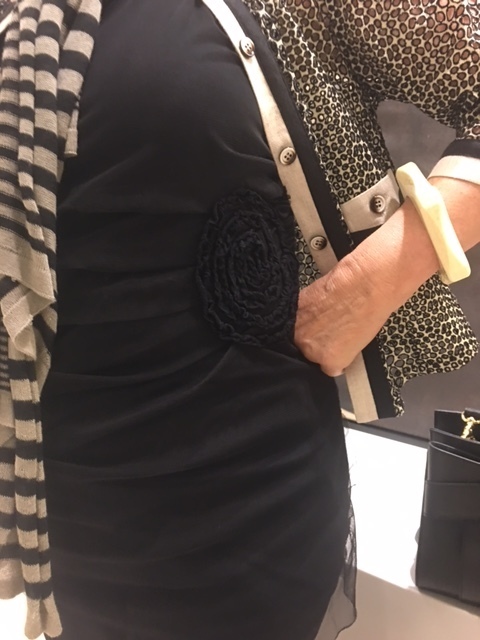 Ruching is a 60-year-olds best fashion friend. Fashion advice: Don’t be flustered when someone compliments you. Don’t get flustered when someone compliments you. You don’t have to tell anybody that you got “it” at a flea market, or on a markdown rack, or it was handed down to you by your sister. Nobody cares. Someone found you delightful and got the courage to tell you so. Don’t spoil it with the schematic details of your outfit. If they want to know those details, they’ll ask. Just smile and say thank you. You matter and fashion can help you understand just how much you matter. Don’t wait; don’t hesitate. Have fun with fashion now because you can! What advice would you give your 60-year-old self? Good advice – and lovely photos. Congratulations! Great advice! It’s never too late to find your style. So very true, Susan. In fact, I think finding your style at this age is so freeing. We can be who we want to be, express what we want to express, and take the time to please ourselves. Great post. 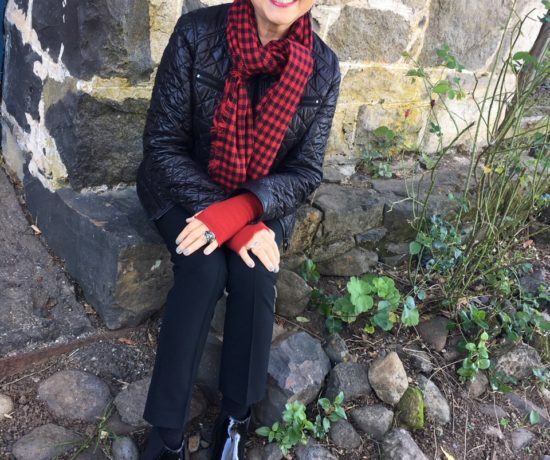 I am 62 and finally feeling comfortable in my own style. I have actually just started posting about it. I think you look great! Love the glasses! I think there’s a big freedom after 60 and your comment seems to confirm that. Being comfortable in your own style is such a good feeling. Maybe we give ourselves more permission at this stage of life? Although of course, I know many people who aren’t quite feeling that but with more focus on the freedom part, maybe they will! Thanks for your comment! I love this idea! Thank you for the wonderful post. Thanks, Mary! I appreciate your comment! Good advice. I would add, always include some color or shine at the neckiline. As we age we loose color in our face and pale neutrals or stark black are problematic for most without such additions. When I let my hair go silver, I had to nix the beiges and golden tones of my younger days in favor of cool blues and purples plus some black and hits of fuschia. It makes all the difference! You make an excellent point. I don’t think I’ve ever said it as well about how to adjust to color as we age. Great advice! I agree with you and others that this is fantastic advice for any age! I also like your comment that you need to give yourself permission, again the younger you do this the better! That is something I’ve really realized lately, it is very freeing to be unapologetic about dressing up as much as you want just because you can and that you like to! A very good point! The more unapologetic, the better. I was doing the style interview with a new client of mine and she was trying to describe a feeling she had (she’s not 60 yet, somewhere in her early 50s) and I was trying to coax it out of her. I said, “No apologies?” She said, “Yes, that’s exactly it.” So that’s one of her style phrases that we use to guide building outfits for her. Now (really any age) is the time to be happy with ourselves and show how great we are on the outside!! Amen, Jodie! Thanks for your comment! 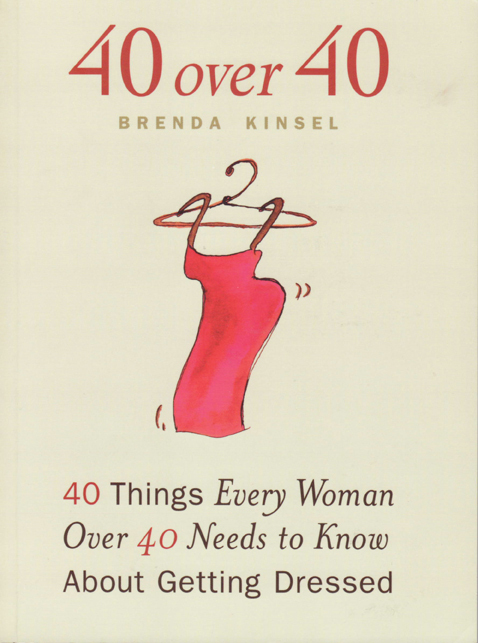 What a jump to the present from Brenda Kinsel’s landmark, “40 Over 40…” which I read in my 40s! 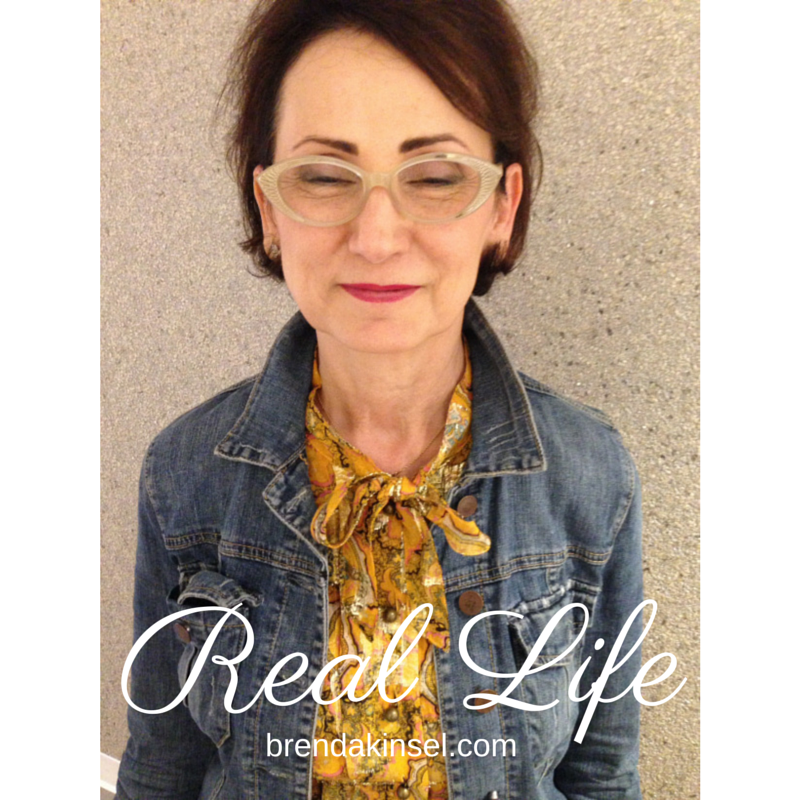 I’m newly 60 and pondering what might be different for me in this decade–fashion wise. I’m feeling more courage to be playful and confident these days. Who really cares? Perhaps only my Self. I might as well have fun. My energy level is different at 60. I seem to require digging deeper for motivation. I’m thinking that it’s a good thing to dig around. Excavation yields wonders. Thank you as always Brenda! Your article is thought-provoking and affirming. I’d say this is very timely. Good for you, Katherine. I really did feel a difference as I walked across the 60-year-old line. I tried to think of fashion icons that were that age–Helen Mirren came to mind–but then I thought it doesn’t really matter if I find fashion icons to copy, I just need to be more of myself. It’s time. Thanks, Katherine for your ever thoughtful comments! I’m not 60, but I’d add-Don’t be afraid to take a risk even when it feels a bit uncomfortable at first. I wore a pair of culottes with beetle boots for the first time the other day. I hadn’t tried it on before to see if I really liked it but knew it was a trend. It felt a little odd, very new and different, but I got a lot of compliments and knew my original idea was good and began to feel comfortable with it instantly. To all of that one additional piece of advice I’d give would be to trust your intuition! Great point, Dana. I love when that happens and we try something and deal with being uncomfortable…until we’re not! You make me think I might want to try it too! NIce article! I’m 62 and in a new place in my life. Fashion at 60 really is uncharted water. I find that the looks that once worked, work no longer. The shifting sands of time have had their way with my body–it is senseless to get upset about it–but I also now have the funds to dress however I like. However, I am finding that as the years go by, I care less and less about being fashionable and more about being who I am. I am also the oldest in my workplace by at least 25 years. So, I quit trying to dye my hair back to its once natural soft red; I am blonde/gray. I pierced my nose. I wear classic jewelry and clothes, mostly black, because that is what I like. I don’t care about designer labels or handbags. We spend our money on travel and experiences. I’m less afraid than when I was 20 and happier too. LIfe is good! I am just shy of 62 now. I look at magazine pictures of expected fashions for my age group and I get very discouraged. I think I am looking at my elderly relatives. I am 5’2″ and petite. I still want to dress in cute outfits. I don’t want to look 20 again but I want to show my young spirit while I still can pull it off. I worked very hard as a critical care RN for over 30 years. Now I believe I have earned the right to enjoy my life wether it be fashion , travel, or anything I want to make me happy. In this time of our lives, we suffer losses and we need to find a way to move on without forgetting those we have lost. If fashion and finding a new life going forward make us happy, then that is what we need to do. Ladies, we cannot let society forget us in the fashion world and when we are remembered, we need to be spoken of as the female generation to follow and honor for the lives we are exemplifying for those that someday will be our age. Your comment takes my breath away! Wow, it is exactly what I think about every day–not wasting another moment “hiding one’s light under a bushel” as that old saying goes. And I want to thank you for your 30 years of service. Being up close and personal with nursing staff during my mother’s accident and then death, I want to shout from the rooftops about the good you do in the world. So yes, now it’s time to enjoy and be happy. I cracked up when you said you thought the magazine pictures looked like your elderly relatives! We have to change that! Thanks, Teresa so much for enlightening us all! Thanks, Imogen! You’re right, the tips are pretty ageless! Brenda I wish you would write a book “60 over 60”. There’s not much out there for those of us heading toward or already 60. I don’t want to dress or look like the style crones. Oh, you’re tempting me, Kathy!!! What are some of the chapter titles in this book you’d like me to write? I’ll get right on it. I’m humbled by your comment. Thanks! Calling all authors out there! Here’s a recipe for a book many people would like to read! I’m with you: more comfortable shoes, dresses with sleeves and great hair styles. Amen! Yes dresses and top with at least 3/4 sleeves. Shoes that do go with dresses and not high heels (too high). Oh my, Kathy, you should check out the website of the actual Style Crone (http://stylecrone.com) who is definitely glamorous in a tasteful, lovely, creative way. I’m thinking maybe you have images from “Advanced Style” in your head; maybe a few pages of Judith’s lovely Style Crone blog pictures would inspire you. I’m a huge fan of her style, though I haven’t figured out yet how to translate it to my much larger body. Thanks for sharing this reference, Nomi! Great advice. I don’t care anymore about what others think, like to be noticed, and don’t worry about being overdressed. But in the same sense I have to continually remind myself to dress for my current lifestyle. You do well at accessorizing and pattern mixing to give visual interest. I especially love the second outfit. Thanks, Constance. I run into the issue you brought up about reminding yourself to dress for your current lifestyle. I see lots of outdated lifestyle clothing pieces in clients’ closets as time has marched on. It’s so freeing when you dress for now. Thanks for your great comments! Congratulations Brenda! Beautiful site and photos! Thank you from offering advice for the age groups the youth focused fashion industry has largely written off. Once women pass 40 they become more assured and less afraid to make courageous and unique fashion decisions. Your choices are elegant, polished and fun. Many women find a lack of choice in fashion once they pass 40. The desire is to look current and chic without looking dowdy. THe lack of designers and clothing lines who address the fashion gap are few. 2Names that come to my fingertips include: Coldwater Creek and J.Jill. Do other accomplished fashion followers have other suggestions? Jeanne, I’m looking at this issue a lot. I was on the phone with a colleague today and she was saying that fashion really changed this year and it’s harder to figure out how to get our figures in to them! I think Chico’s addresses this woman well if their lifestyle format fits yours. I actually also have luck at Ann Taylor of all places! I think we need to start a list! Thanks for raising this issue, Jeanne. Brenda what a great post!!! You are such positive role model for us 60+ gals. I especially like the comment “don’t get mad about what you can’t change”. That only leads to frustration. I love the new website and look forward to more posts . . . and pictures. Comments like yours give me the motivation to stay on top of my blog and keep talking to our demographic. 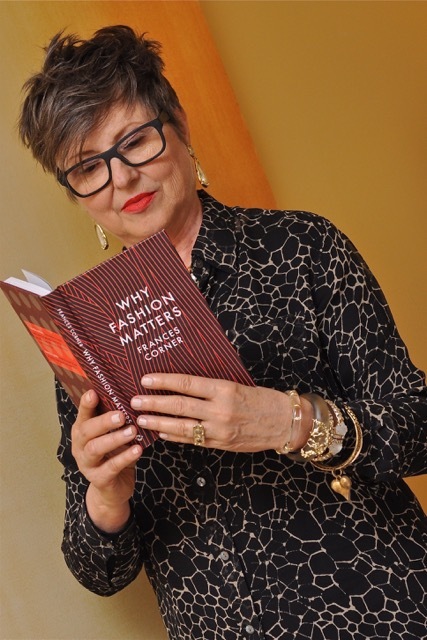 Fashion and style can be fabulous at any age but I think at 60, we’re sitting on a gold mine of fun with fashion! Please. Please. Please. Write “60 over 60”! Love your books! We 60+ want to look good too! I have to say I love your enthusiasm! Thanks for the encouragement! 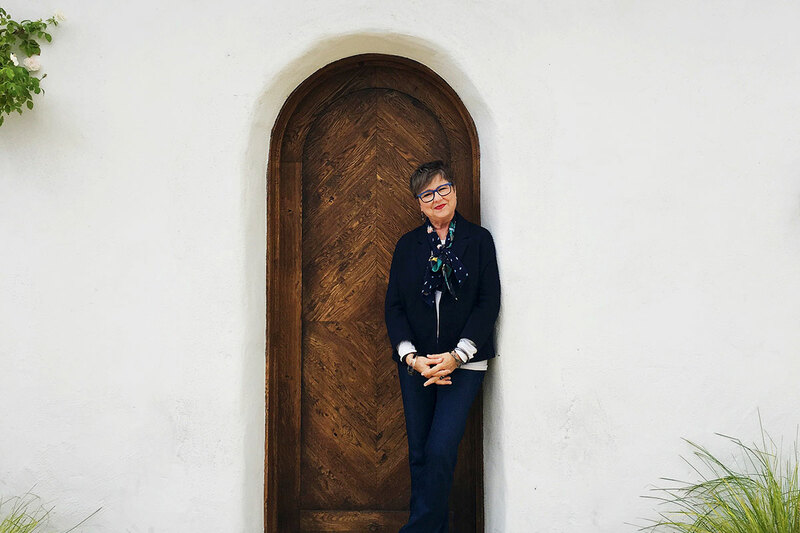 I’ve read your books and articles and echo the encouragement to write “60 over 60.” I’m turning 60 on Sunday and trying to wrap my head around how I got here so quickly. I’m a teacher (and love it) and am one of two teachers this age in the school. I like fashion, but I’m fairly casual. I’m becoming more comfortable with standing out as I get older. Love your fashion advice! Well “Happy Birthday” is in order! I think it’s so interesting about how you’re more comfortable standing out. Maybe that’s one of the chapters! I take your encouragement to heart. Enjoy your birthday, Lorrie! Let’s say something for the over 80! You don’t stop loving fashion if you always had so just keep watching the trends and incorporate them in your wardrobe! You are so right! Maybe I can interview you and find out more about fashion in one’s 80s? I see women beyond 75 who are still enjoying fashion. Maybe you have more to share with us? I love love love your advice. I’m 73 (in a week), love wearing my tights and boots, and I and another friend (who dresses like me) get looked at strangely by women our age and older in my 55+ building. But I don’t care – my weight is excellent, I’m tall and the clothing looks good on me. And darn it, I feel great dressed stylishly. I wake up, make my bed, get dressed and put on all my jewelry even if I don’t leave my building. And I love asymeteical clothing, long tunic tops, and lots of rings. As you say, I dress like I’m going to a party and it makes me feel good – every day is a party as far as I’m concerned. Love your stylish attitude. FANTASTIC!!! Thanks so very much for sharing. You’re inspiring us! I’m 60. My fashion advice for this age is to be comfortable. Wear clothes that suit the occasion and you don’t have to think about. You do not have to wear high heels, or any sort of heel if it makes you feel unstable, in pain, or restricted from activities. Stick with a limited number of colours so most of your clothes will mix and match. I wear black, white, navy, grey and blues and reds that work with those. I have only a few other coloured items. I live by the beach in a sub tropical area. For three or more months a year, everyone, of every age, wears shorts. Just make your age appropriate. Don’t wear too many accessories. How can you just jump into the sea on a whim, clothes and all, if you are wearing jewellery and carrying a mobile phone. I wear my clothing for freedom and for making the best of my body shape. Thanks, Linda! I love the focus on freedom. 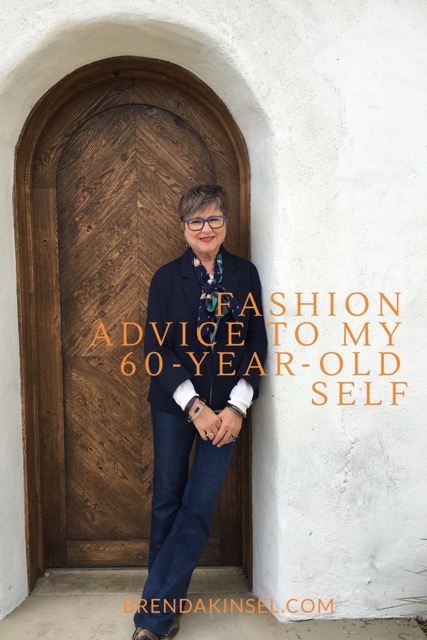 Thanks so much for sharing your formula for fashion advice for women over 60. It all makes sense to me! Love this article and you! You are the queen of your words and an inspiration. Yes, yes, yes, yes, yes!! Brenda, thanks for much for this! I have discovered that I want to be like Iris Apfel — all the color and fun accessories. I don’t think I have the courage or long enough arms for that many bracelets at one time, but I love her spirit and her use of color. Why is it that so many women only wear black? I’ve decided that I will wear color and fun accessories and have fun with them in honor of Iris! How wonderful to have a role model in mind. You’re over half-way there! A beautiful scarf is a key element to anyone’s outfit. It can be used as a wrap also if it gets chilly in a restaurant or anywhere. It makes your outfit look finished and crisp. I also enjoy wearing unusual vintage fashion costume pins. If I am feeling feisty, I wear snake or animal figural pins. For a more elegant look, I rely on pearl, silver or gold embellished pins. Most of all, have fun. Be well. These are the good times. Loved the image of how you use your accessories. I went to school with a Kathy Reiter. Our lockers were right next to each other because my maiden name is Reiten. It is so fun to see your name pop up! Yes, you’re right, these are the good times. We all should not take ourselves so seriously and enjoy everyday. So well said. For a long time I saved too many outfits for a “special” event. Such a waste. Now I look at every day as “special”. Kathy, I hope more and more people follow your lead and treat each day as special! Deportment is really important too. As we get older, we are sometimes stiff and a little sore. Don’t let it show. And confidence. Walk into a room/event/meeting as if you own it. Make eye contact, and hold it. Smile and move forward towards the other person. And listen to what they have to say. They will appreciate it and warm to you, increasing your own feelings of self esteem. Wendy, you are so right! I love this advice. Thanks so much for sharing! Yesterday I was at an event where there were many young people and connecting with them through eye contact and real listening is a gift that’s so appreciated. Wise words, Wendy! I love the comments about women 60 up I have always loved fashion. Love to shop an wear nice clothes. I shop Chico’s, Ann Taylor, Jan jill. Your comments really made me feel good. I will be 62 in one month I ready for a new outfit to celebrate life. Go for it! Celebrate life! HELP!! I am heading for the 80 mark but certainly don’t feel it. I don’t know how to put together fashion statements!!! I want to look fashionable, ;not like an 80 year old (OLD) lady. I want to look elderly fashionable, if that makes sense. Any rules I should be following???? Oh—-and I am losing my hair due to a med I am on. Not to the bald state but very thin. Any ideas for head wraps????? THANK!!! So glad I found this site! !